Idyllwild is one of the many towns throughout the state that have been affected by fires this year. Our community understands the importance of giving back to those affected by the fires and it has done a lot to help not only those affected by the Cranston and Holy Fire, but now the Camp Fire in Northern California. 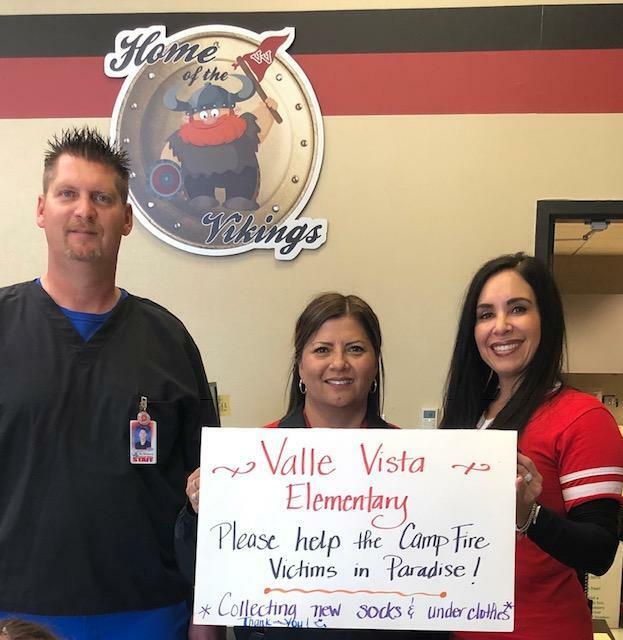 Staff from Valle Vista and Little Lake Elementary used donations they received to donate to families in Paradise. The Principal at Valle Vista Elementary, Dr. Christine Ramirez, grew up in Gridley, California, one of the neighboring towns of Paradise. After hearing about the fire, she knew she wanted to do something to help the victims of the Camp Fire. She soon realized that many Valle Vista staff members also had family and friends that live in Paradise and were looking for ways in which they could help. Dr. Ramirez said her family was helping in the shelter and donation centers and realized that although there were many donations, people were lacking socks and undergarments. Dr. Ramirez decided to send out an email to Valle Vista staff asking for clothes and undergarments that she would drive to Northern California over the Thanksgiving break. A Health Tech at Valle Vista, Erik Drinkard, talked to his significant other, Tina Mathis, a custodian at Little Lake Elementary and the Parent Resource Center, about the donation email and she recalled seeing sock donations at Little Lake. Tina reached out to the teacher in charge of the donations, Roberta Smith, at Little Lake and asked if she would like to donate some of the socks to the victims of the Camp Fire. Roberta agreed and they were able to deliver the donations to Dr. Ramirez at Valle Vista. In addition to helping the victims of the Camp Fire, about half of the sock donations collected from Little Lake were donated to Valley Restart in Hemet. Roberta Smith said this is the second year she has hosted Socktober and the number of donations more than doubled from the previous year. Last year, she collected 304 pairs of socks and this year she collected 657. She estimated that over 200 pairs were given to Valle Vista to donate to the victims of Camp Fire. “Socktober is a great way to get our students excited about thinking about others and giving what we can to help. We hope this helps keep our community a little warmer during these chilly months,” said Smith. Over the Thanksgiving break, Dr. Ramirez delivered over 350 socks and some undergarments to the Sacred Heart Church in Gridley and their Priest, Father Brown, assisted Dr. Ramirez and her family in distributing items to St. Paul’s de Vincent’s Society and the Gridley Fairgrounds Victim’s Relief Center. Thank you to the staff and families at Valle Vista Elementary and Little Lake Elementary for your donations and helping those affected by the Camp Fire and our citizens here in Hemet during these colder months.